One cappuccino, one Time magazine, one banana bread leaf and multiple listens of The Teenagers remix to Vampire Weekend's "Cape Cod Kwassa Kwassa" later, I'm still sitting at the airport waiting for my flight to La-La Land. Thought I'd be able to kill some time visiting DB at his gate earlier, but his flight east to NYC has a domestic stopover first, then transfers to international, so he was basically at the opposite end from me. 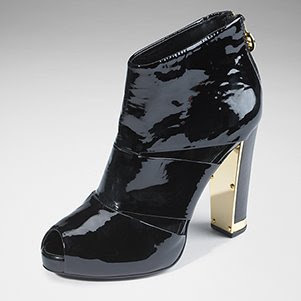 Yesterday, I went to Holts with Ovitch and saw two things to add to my burgeoning wish list: A two-toned blue Balenciaga saddle bag with oodles of gold hardware (it was a heavy one) and the Jeslann stacked heel bootie from Tory Burch in patent purple and black. Someone had ripped the tag off the Balenciaga, but my edu-macated guess would place the figure at least $1,000. And that's reduced from the original price. The Tory Burch was $495. All I could think of was calling my girl Alice to find out if she still got her 50% discount at Holts, though I'm pretty sure the answer is negatory, since she's long since moved onto managing an upscale retailers (stocked with Isabel Marant!). I'll try to find an image of the Balenciaga, but all I'm coming up with for now is the ubiquitous motorcycle bag. For now, enjoy Tory Burch's Jeslann below. Can't wait to see my mom and dad! !